AMT Corporation / Round 2 LLC has finally reissued the Man from UNCLE car kit, but with a few twists! 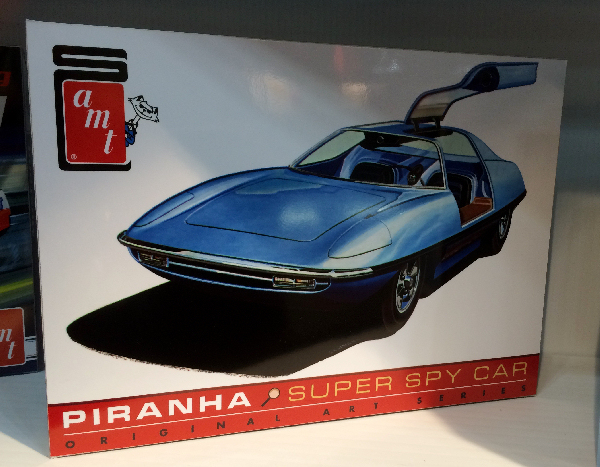 First, they did not purchase the rights to use the Man from UNCLE name, so the car is called the "Piranha Super Spy Car." Slightly modified original box art has been used with a few additions. There are also two versions of the kit. The Standard Version and the "Original Art Series" version. The Standard Version is in a regular size box with the kit molded in white with black wall tires. It also has chrome, clear, and red parts, but no decals. It is a few dollars cheaper than the other version. The Original Art Series kit is in a flat box with the kit molded in a nice metallic blue. The other parts are the same as the Standard Version except that there is an extra set of smoked glass for the windows, a decal sheet with various classic graphics, and tires with a red stripe printed on one side and blue lettering on the other. There is also a full-size AMT Speed & Custom Division decal in the box as well as a 12-page booklet featuring various photos of the AMT Piranha and UNCLE cars. Plus, a large art print of the box art, suitable for framing. This kit is only a few dollars more than the Standard Version so I recommend buying it instead of the Standard kit. Both kits can be found at most hobby shops and on eBay.